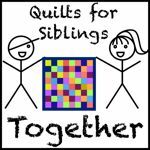 I had to do a quick post about this while I’m online … and there’s a new button up there on the right - for Lynne at Lily's Quilts new flickr group for Brit quilters. I’ve always been surprised at the lack of any real community online presence among us Brits - without ever having the brainwave of actually doing something other than moan about it - so this is such a great great idea. Yay! Lynne, you. is. genius. Let’s see if we can get to that first 100 eh?